Protect your bags from contact with the brake or swingarm with these Chrome Saddlebag supports. 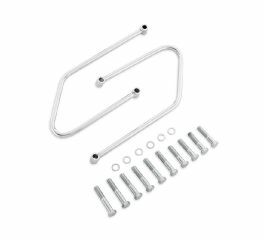 Fits '84-'06 FL Softail® models (except FLSTS) and '84-'05 FX Softail® models (except FXSTD). Will not fit with H-D® Detachables™ accessories.